On the bow of the boat somewhere between the north and south of Guadeloupe James asked me “what day is it today?”…”It’s Thursday, I think” was my reply. It is not an easy state of mind to reach but now it has been achieved it will be hard to give up….no news reader to remind us of the time or date or traffic conditions or even the state of the globe and with only intermittent internet access to check out the news it is as close as we will ever be to disengaged. Not sure at this stage if that is good or bad? Not long after we parted ways with Antigua, we decided to hike from the lovely French village of Deshaies, in the north of Guadeloupe, along the river (of the same name). The book described it as a path with some rock jumping, about 3 hours return in duration, to a beautiful gully and a waterfall. We set off with Mike and Charlie into a rainforest wilderness on a typical Carribean road via a garbage dump. It was serenely quiet except for the sound of the river running to the sea and once we were out of the view of the town it became a tropical riverbed full of large boulders, ferns and intermittent pools of fresh water almost big enough to swim in. All good! The road ran out, and was replaced by a type of track. The track ran out and was replaced by nothing – the next 2 hours were a rock hopping, step class that any personal trainer would have been proud of! Sweat poured off, our shoes became wet and slippery causing a couple of minor falls and by the time we got back to the boat exhaustion and stiffness had set in (well to me anyway)…seriously a great day!! A long session of snorkelling around the circumference of Pidgeon Island was like a quick trip around the world. It dawned on me that life under the water goes on night and day just as it does on the land – this place is a microcosm of the world. It was quickly evident that there are different types of terrain including the desert (large patches of sand), hills, mountains, gullies and gorges, rocks with vegetation and forests waving in the current. To boot is the varied fish life ranging in size from almost microscopic to edible size; some are long and lithe, some are short and dumpy, some are taller from fin to fin than they are from gills to tail and they also propel themselves in different ways! I watched as a colourful orange and black fish swam past me as if it was turbo-charged and it reminded me of a wind up bath toy. Particularly noteworthy is the fact that I now understand why groups of fish are called schools…I recognised the snooty private school group all dressed up in dark blue blazers and swimming together in a tight format, the naughty high school group in a myriad of colours doing their own thing, the school bully who would target a lone youngster and head at it like a missile just to frighten it, the Headmistress in black with lips pursed, and the kindergarten group, oh so cute, being shepherded by the class teacher – of larger size and dowdy colouring. And always lurking, like the officious legislator, we saw a large barracuda, just looking for an excuse to hang around! Even the coral is a reminder of the world above – it’s architectural shapes a reminder of cathedrals and tubular buildings that are the receptacle of large numbers of fish which hang around with purpose or peep out from underneath mimicking the human race! 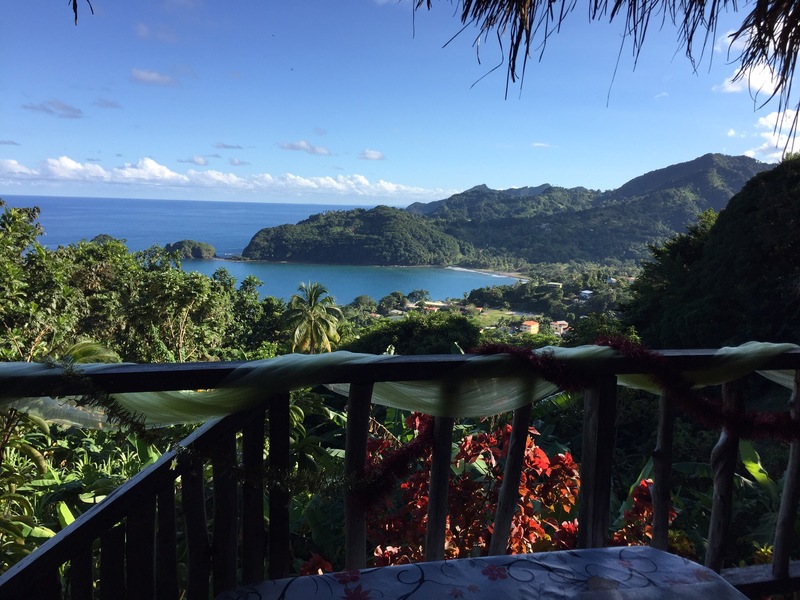 Dominica is best described as a Garden of Eden! Gone is the European influence of the islands we have just previously visited; this place is a naturalists dream! We spent a day (10 hours if truth be known) in a mini van driven by Winston, a 68 year old local with one eye who grew up in Dominica and is passionate and protective about his beautiful homeland. He steered us around the island using his horn at any and every opportunity and knowing the roads well (sometimes I had to close my eyes) we gleaned a bit about the history and culture of the island. The physical devastation that Dominica suffered in more recent times, including the torrential rains that hit on August 27th 2015, has left it with major road issues with bridges being washed away (the use of the Bailey bridge system reminded me of a divided Hobart when the bridge was hit by a ship in the 1970’s) and parts of the road hanging on to the edge for grim death, but even that doesn’t detract from the overwhelming and stunning beauty of the island. The fruit and vegetables grown here are prolific – bananas, watermelon, limes, sugar cane, pineapples are abundant and the dense verdant vegetation is incredible! A slow boat ride up the Indian River at sun-up topped us up with Dominican flavours and the constant reminder on the road signs of “Keep Dominica beautiful” seems perfectly achievable! Wonderful Tig . All sounds good to me ….. 😄 Freezing in London !